The SOS switch (code 494) is integrated in the overhead control panel control unit but is read discretely by the emergency call system control unit. The overhead control panel control unit is an interior CAN subscriber in the overall network. Pressing the left front reading lamp switch (1) switches the left reading lamp (11) on the underside of the inside rearview mirror unit on or off. Pressing the right front reading lamp switch (2) switches the right reading lamp (12) on the underside of the inside rearview mirror unit on or off. Pressing the rear dome lamp switch (3) switches the interior illumination in the rear on or off. Pressing the front dome lamp switch (4) switches the left and right front dome lamp (5) in the overhead control panel on or off. 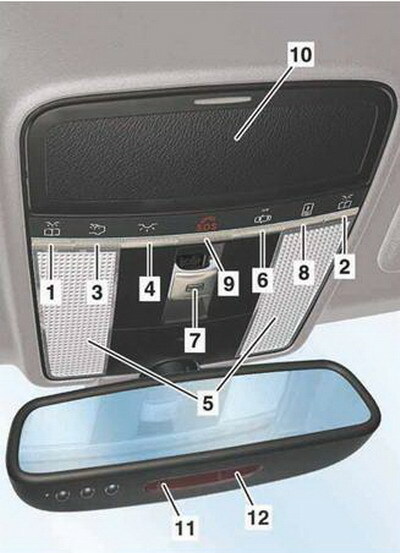 Pressing the door contact ON and OFF switch (6) activates the automatic control for the interior illumination. • The transmitter key is removed from the ignition lock. Pressing the door contact ON and OFF switch (6) again switches off the automatic control for the interior illumination. The indicator lamp "OFF" next to the door contact ON and OFF switch (6) lights up. Circuit 15R or circuit 15 must be switched on to actuate the tilting/sliding roof. Pulling the roof switch (7) towards the rear up to the actuation point and holding it there opens the tilting/sliding roof for the duration of the actuation. Pulling the roof switch (7) towards the rear over the actuation point and briefly holding it there automatically opens the tilting/sliding roof all the way. Pressing the roof switch (7) upwards to the actuation point and holding it there raises the tilting/sliding roof at the rear for the duration of the actuation. Pressing the roof switch (7) upwards over the actuation point and briefly holding it there automatically raises the tilting/sliding roof all the way at the rear. The tilting/sliding roof can be stopped in any desired position during automatic operation by briefly actuating the roof switch (7) in any direction. The tilting/sliding roof stops in its current position. Vehicles without code 494 are equipped with a memory function for automatic operation i.e. the tilting/sliding roof always opens to the last open position when opened automatically. The roof switch (7) must be pulled over the actuation point for a second time to open the tilting/sliding roof all the way. Circuit 15R or circuit 15 must be switched on to actuate the panoramic sliding roof and open the front roller sun blind. Pulling the roof switch (7) towards the rear up to the actuation point and holding it there opens the front roller sun blind for the duration of the actuation. Pulling the roof switch (7) towards the rear over the actuation point and briefly holding it there automatically opens the front roller sun blind all the way. The front roller sun blind can be stopped in any desired position during automatic opening by briefly actuating the roof switch (7) in any direction. The front roller sun blind stops in its current position. The front roller sun blind is always closed by pressing the roof switch (7) to the front and holding it there until the blind is fully closed. Pulling the roof switch (7) towards the rear up to the actuation point and holding it there opens the panoramic sliding roof for the duration of the actuation. Pulling the roof switch (7) towards the rear over the actuation point and briefly holding it there automatically opens the panoramic sliding roof all the way. The panoramic sliding roof can be stopped in any desired position during automatic opening by briefly actuating the roof switch (7) in any direction. The panoramic sliding roof stops in its current position. The panoramic sliding roof is always closed by pressing the roof switch (7) to the front and holding it there until the roof is fully closed. Pressing the roof switch (7) upwards to the actuation point and holding it there raises the panoramic sliding roof at the rear for the duration of the actuation. The panoramic sliding roof is lowered by actuating the switch in the opposite direction. Pressing the roof switch (7) upwards over the actuation point and briefly holding it there automatically raises the panoramic sliding roof all the way at the rear. If the front roller sun blind is still closed, it is first opened automatically and then the panoramic sliding roof is automatically raised all the way at the rear. The front roller sun blind can only be closed if the panoramic sliding roof is closed. It is not possible to close the front roller sun blind automatically. It is not possible to automatically close the panoramic sliding roof or automatically lower it at the rear. The roller sun blind at the rear can be operated from the front using the rear roller sun blind switch (8). 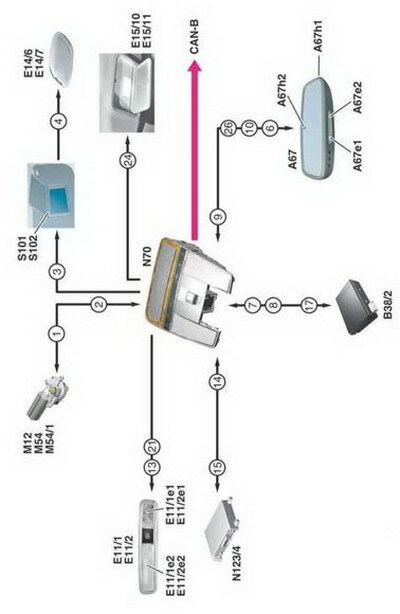 The rear roller sun blind is opened or closed by pressing and holding the rear roller sun blind switch (8) until the roller sun blind in the rear has reached the desired position. The roller sun blind at the rear must first be completely opened or closed before the direction of actuation can be changed. Pressing the SOS switch (9) transmits an emergency call manually. The indicator lamp next to the SOS switch (9) flashes to indicate that an emergency call has been activated. The overhead control panel is equipped with an eyeglass compartment. The eyeglass compartment (10) is opened by pressing the silver fin. The eyeglass compartment (10) is closed by folding it upwards until it engages.